Amylulita says...: June 15: Weaving In & Out art opening tonight! No Longer Empty is pleased to present Weaving In & Out, a collaborative exhibition in a new green development in East Harlem. The exhibit will take over the raw ground floor space of a residential property called Tapestry located at 245 East 124th St. In keeping with No Longer Empty’s curatorial practice of site specificity, this exhibition explores the interactions between this particular space and its surrounding physical and cultural contexts. 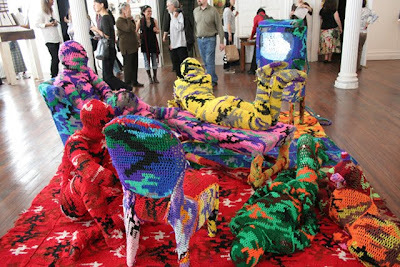 "Weaving" appears in the title as a metaphor for the interconnected artistic actions, and the intertwining of people, projects and ideas here. Curated by Jodie Dinapoli, Ella Levitt, Manon Slomewith Trinidad Fombella from El Museo del Barrio. The project is made possible by Jonathan Rose Companies. The exhibition and accompanying programming were organized in collaboration with The Artist Pension Trust, Art for Change, El Museo del Barrio and The West Harlem Art Fund. I loved Grimanesa Amoros installation. The circles were really interesting and when the sunset and the video appeared it was a wow! GRIMANESA Amoros consistently challangers herself and art lovers like myself feed and enjoy the experience.